Bread Baking Day created by zorra celebrates the second anniversary. Literally in the last moment I managed to fire up my oven for the Pizza Party. As I have already blogged about my preferred pizza recipe, I tried something new. 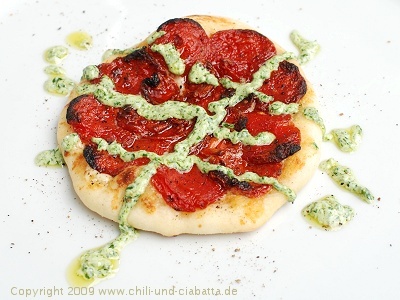 The original recipe for these pizzette is from Tanja Grandits Aroma pur – Meine fröhliche Weltküche. I made a few changes: using less yeast and letting the dough ferment overnight yields a more aromatic dough. Don't use too small tomatoes. 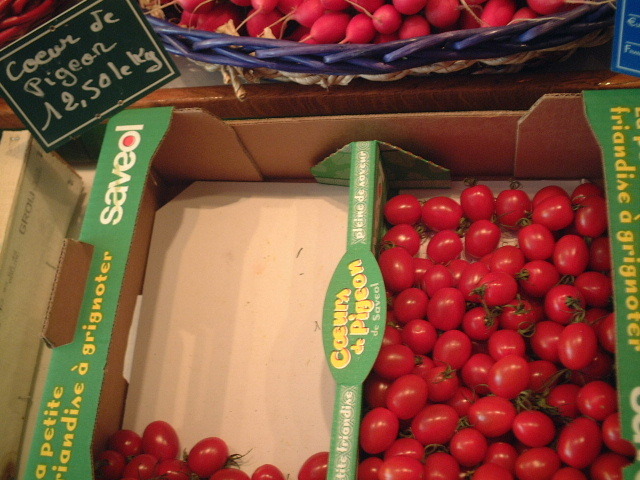 At first I tried "Coeur de Pigeon" which produced confit tomatoes in the size of a thumbnail. So I made a second batch with cocktail tomatoes – much better. Other than Grandits I baked the pizzette on a baking stone in a very hot oven. The taste of the confit tomatoes on these little pizze is fantastic: sweet and incredibly aromatic. The pesto matches very well. It is originally made with cilantro instead of parsley. As I can't get fresh cilantro here I used parsley which is growing in my garden (this change made my son happy because he dislikes cilantro). Pizza dough: the evening before make an elastic dough (this can be easily done in a bread baking machine). Put the dough into an oiled freezer bag and place it in the refrigerator overnight. Confit tomatoes: Preheat oven to 100°C. Line rimmed baking sheet with aluminum foil, brush it with some olive oil. To peel tomatoes, drop into boiling water for a few seconds. Remove immediately and plunge into cold water. Peel the skin off, halve the tomatoes and remove the seeds. Place them outside up onto the baking sheet. Dust with powdered sugar, salt and pepper and drizzle with the oilve oil. Bake for 2 hours in the oven. Let cool. For the pesto place salt and garlic into a mortar and pestle. Add parsley, pines nuts, pestle thoroughly (you can also use a mixer). Slowly add the oilve oil, stirring. Add goat cheese, parmesan and stir until combined. Salt and pepper to taste. One hour before baking take the dough out of the refrigerator. Mix mascarpone with parmesan and grated orange peel. Preheat an oven to 250-275°C placing a baking stone on the lowest rack. Divide the dough into 8 parts, keep covered. Working in batches form little round pizzette, spread with mascarpone-cheese mixture and put the tomatoes on top. Bake in the hot oven for about 5-7 minutes. If the tomatoes get to dark, cover with aluminum foil. Serve hot with the parsley-goat cheese pesto. Petra: Grandits uses a dough with more yeast without fermenting overnight. She bakes the pizzette at 180°C for 10 minutes. My recipe looks more like a pizza. 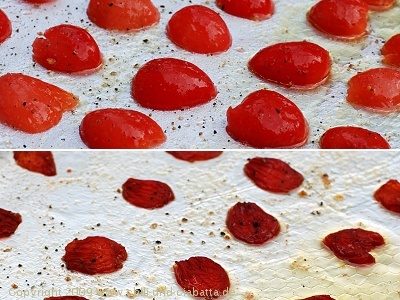 *I used the whole of the confit tomatoes for 4 pizzette. Cocktail tomatoes are fine. Lien has chosen a very interesting theme for bread baking day #17: bread and potatoes. I really like potatoes in bread: they give a nice flavor and the bread stays fresh for a longer time. I already tried quite a lot of recipes using potatoes, so it wasn’t that easy to pick an interesting new recipe for the event. 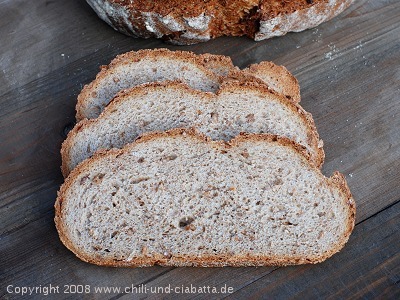 Under the christmas tree I found a new bread baking book featuring rye (Roggen Das Standardwerk). One recipe in this book uses a soaker of dried potato flakes and coarsely ground rye (which I substituted with 5 grain chops) and a small amount of rye sourdough. Of course I had to try this. and an open crumb. The taste is excellent. As the book is meant for the professional baker, the original recipe yields 20 breads. I cut it down to one-tenth. Das Rezept für das knusprige Kartoffelbrot mit Roggensauerteig gibt es unten. The evening before baking mix water, sourdough and rye flour. Let ferment covered for about 16 hours in a warm place (I use my microwave oven with the door slightly open so that the light is on). 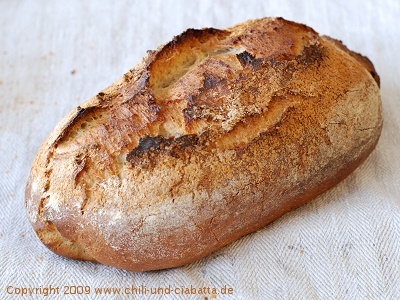 The next day combine sourdough, soaker, rye flour, bread flour, water and yeast in the bowl of a stand-type mixer. Mix on low speed for about 4 minutes (Kenwood on 1), then add the salt and mix another 5 minutes on medium speed (Kenwood on 3). The dough will clear the sides of the bowl. Desired dough temperature 28-30°C. Put the dough in a lightly oiled bowl and let ferment covered for about 40 minutes. Divide the dough into 2 halves (each about 560 g). Preshape lightly into rounds and let relax covered for about 5 minutes. Then shape into oval loaves, brush the surface with a little bit of water and sprinkle the loaves with potato flakes. Put the loaves upside down into floured bannetons an let rise covered for about 45 minutes. Preheat the oven with a baking stone to 250°C. Transfer the risen loaves seamside down onto a peel. Score the loaves lengthwise and load them into the oven, spritzing in water twice in the first 5 minutes. Reduce the temperature to 230°C and bake for another 35 minutes. Use aluminum foil if the bread gets too dark. Let cool the breads completely on a rack before slicing. 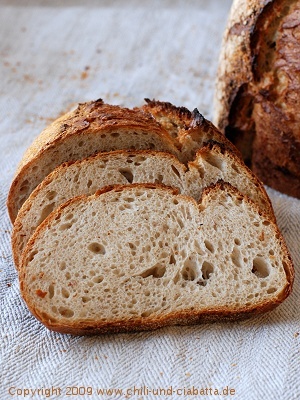 Very crusty breads with an open crumb. Very nice taste. Am Vorabend Wasser, Sauerteig und Roggenmehl vermischen. Abgedeckt etwa 16 Stunden an einem warmen Platz gehen lassen (Petra: Mikrowelle mit angelehnter Türe). 5 Korn-Schrot, Kartoffelpüreeflocken und Wasser verrühren und abgedeckt etwa 15 Stunden bei Raumtemperatur stehen lassen (20°C). Am nächsten Tag Sauerteig, Quellstück, Roggenmehl, Weizenmehl und die im Wasser aufgelöste Hefe in die Schüssel der Küchenmaschine geben. Auf Stufe 1 (Kenwood) etwa 4 Minuten kneten, dann das Salz einrieseln lassen und und weitere 5 Minuten auf Stufe 3 kneten. Der Teig löst sich von den Seiten der Schüssel. Erwünschte Teigtemperatur 28-30°C. Den Teig in eine leicht geölte Schüssel geben und abgedeckt etwa 40 Minuten gehen lassen. Den Teig in 2 Hälften a etwa 560 g teilen. Erst grob rund formen, etwa 5 Minuten entspannen lassen, dann zu länglichen Laiben formen. Die Oberfläche mit Wasser bepinseln und mit Kartoffelflocken bestreuen (oder die Laibe in Kartoffelflocken wälzen). Die Laibe mit der Naht nach oben in bemehlte Gärkörbe geben. abgedeckt etwa 45 Minuten gehen lassen. Rechtzeitig vorher den Backofen mit einem Backstein auf 250°C vorheizen. Die Laibe vorsichtig auf einen Brotschieber stürzen, mit einer scharfen Klinge der Länge nach einschneiden und mit Dampf in den Ofen einschießen. In den ersten 5 Minuten noch 2 mal Wasser einspritzen, dann die Temperatur auf 230°C reduzieren und die Brote weitere 35 Minuten backen. Bei Bedarf mit Alufolie abdecken, damit sie nicht zu dunkel werden. Die fertigen Brote auf einem Rost auskühlen lassen. Anmerkung Petra: Sehr schön knusprige Brote mit mittelporiger Krume und ausgezeichnetem Geschmack. Favoriten! Zorra invites us to bake a Kings Cake for January 6. 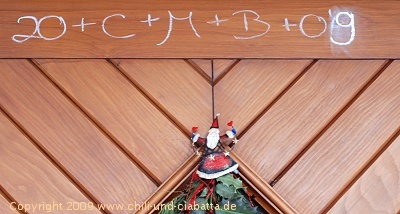 In these days the Sternsinger (see Star Boys' Singing Procession for Germany) – children dressed as the 3 kings – visit almost every house here, collecting money for charity and writing C+M+B (the abbreviations for "Christus mansionem benedicat", some believe it to be the initials of the three kings' names) above the main door of the home to confer blessings on the occupants for the New Year. 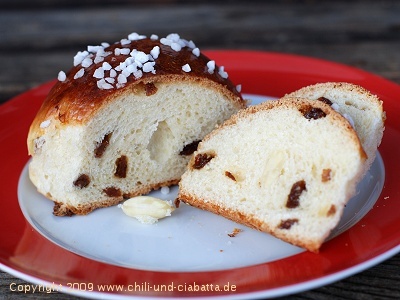 Although a kings cake has no tradition in our family, for me it's the third one: in 2007 I baked a mexican rosca de reyes, in 2008 a french gâteau des rois and this year I chose a swiss Dreikönigskuchen. For the cake I used a mixture of all-purpose flour and swiss Zopf flour, a mixture of about 90% wheat flour and 10% spelt flour. Das Rezept auf Deutsch findet sich hier in meinem Brotkasten. 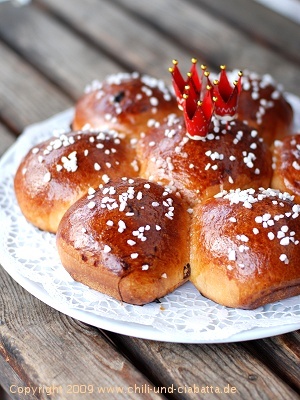 Make a yeast dough by hand or machine, kneading in the raisins at last. Let the dough rise in the refrigerator for about 4 hours, then turn it out onto the working surface. Divide the dough into 6 smaller parts (mine were about 140 g) and one bigger part, roll the dough into balls, placing the almond into one of the balls. Butter a tart pan (30 cm diameter) or use baking paper. Put the big ball in the middle surrounded by the smaller balls. Cover and let ferment in a cool place until doubled (I used the cool cellar steps which took about 4 hours and 1 hour at room temperature; you can also leave the cake in the fridge overnight). Preheat the oven at 175°C (350°F). Brush the cake with an egg yolk mixed with some drops of water or milk. Bake the cake in the lower third of the oven for about 40-50 minutes. Remove the cake from the oven and put it on a rack. Mix the apricot jam with 1-2 tb of water (it should not be too fluid), warm it up a little bit and pass it through a sieve. Brush the warm cake with the jam and sprinkle with coarse sugar. As already in the last two years today Zorra invites us again to bake a bread for World Bread Day. Whereas I baked bread loaves in 2006 and 2007 this year I went for something different. On one of our last visits to Italy I bought a bag of spicy Taralli al Peperoncino, Chilli Taralli. 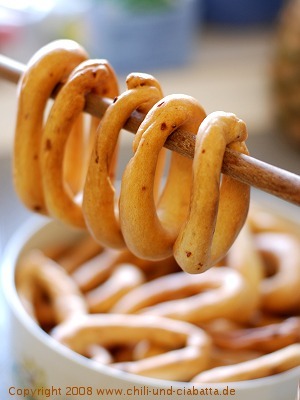 Taralli, the oval-shaped bread“sticks“ originating in the southern Italian region of Puglia, make a very nice snack food with a glass of wine or a cold beer. They may be flavored savory or even sweet. Back home I used a recipe from Maggie Glezer’s Artisan Baking Across America for Fennel Taralli, omitted the fennel and added both ground and crushed chiles. Like bagels Taralli are boiled before they are baked in the oven. Taralli keep very well. Das deutsche Rezept für Chili-Taralli gibt es unten. In a small pitcher, sprinkle the yeast over the warm water, stir, and let stand for 5-10 minutes. Combine the all-purpose flour, durum flour, ground and crushed chiles and salt in a large bowl. Add the olive oil, white wine and yeasted water. Mix the dough together, then knead this incredibly stiff dough until it smooths out a little. Immediately after mixing, cut the dough in about 60 pieces (each 3/4 oz, 20 g). Place a cup of water next to you to help you roll. Dampen your hands with just a few drops of water and roll a piece of dough into a rope about the thickness of a pen. It should be about 7-8 inches long (18-20 cm). Pinch the ends together hard. Hold the rope ring together at the seal and let it drop into an elongated oval shape. Place it on a tray. The seal should be at the top curve. Continue to roll and shape the rest of the taralli. 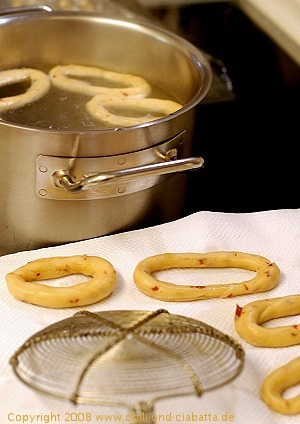 Cover the taralli with plastic wrap and let them rest for 2 hours. They will not appear to rise at all. Preaheat the oven to 400°F (205°C). Fill a wide pot three-quarters full of water, add some salt, bring it to a boil, and then lower the heat so that the water simmers. Add the olive oil to the simmering water. Line a baking sheet with some tea towels. Line 2 large baking sheets with baking paper. Boil the taralli in batches small enough to fit comfortably in the pot. They will sink at first then quickly float (if they do not float, let them continue to rest for another hour, then boil them). After they float and puff up a bit, after about a minute of boiling, skim them from the pot and let them drain on the tea towels. Boil the remaining taralli. After each batch has drained, move them to the paper-lined baking sheets. When you have finished boiling the taralli, bake them until they are golden brown and very dry, about 45 minutes, rotating the baking sheets halfway into the bake. Let them cool on a rack and store them in a sealed container. Petra: the dough is really incredibly stiff. If it is too stiff to handle, add a few drops of water. Die Hefe zum Wasser geben und 5-10 Minuten stehen lassen. Weizenmehl, Hartweizenmehl und Salz in einer großen Schüssel vermischen**. Öl, Weißwein und das Hefewasser zugeben. Alles zu einem Teig verkneten. Den sehr festen Teig* kneten, bis er etwas weicher wird. Dann die Chiliflocken unterkneten (kann auch im Foodprocessor gemacht werden – hier alle Zutaten außer dem Hefewasser hineingeben, dann das Hefewasaser bei laufender Klinge zugeben. Chili von Hand einkneten). Sofort nach dem Kneten den Teig in Stücke a etwa 20 g teilen. Ein Schälchen mit Wasser bereit stellen. Jedes Teil mit leicht angefeuchteten Händen zu einer bleistiftdicken Rolle von etwa 18-20 cm ausrollen. Die Enden fest zusammenkneifen. Den Ring an der Verbindungsstelle hochnehmen und herunterhängen lasen, so dass sich ein kettengliedförmiges Oval bildet. Die Kringel auf 2 Backbleche legen, mit Klarsichtfolie abdecken und etwa 2 Stunden stehen lassen. Der Teig geht dabei nicht merklich auf. Den Backofen auf 205°C vorheizen. Einen weiten Topf zu 3/4 mit Wasser füllen, salzen und zum Kochen bringen. Das Olivenöl zugeben, die Temperatur reduzieren, das Wasser soll simmern. Einen Backofenrost mit einem doppelt gelegten Küchentuch belegen und neben den Topf stellen. Die Kringel portionsweise in den Topf geben. Sie sinken erst zu Boden, steigen aber dann rasch auf. Etwa 1 Minute kochen lassen, dann mit einem Schaumlöffel herausheben und auf dem Küchentuch abtropfen lassen. Die Kringel dann auf das Blech mit dem Backpapier legen. Die Bleche in den Backofen schieben und die Taralli etwa 40-45 Minuten backen, bis sie goldbraun und vollkommen trocken sind, dabei nach Hälfte der Backzeit die Backbleche tauschen. Auf einem Gitter abkühlen lassen, dann in einer gut schließenden Blechdose aufbewahren. *der Teig ist wirklich unglaublich fest. Beim nächsten Mal evtl. mehr Flüssigkeit zugeben. Aus Versehen Weizenmehl Type 550 verwendet. ** ich habe die Chilis gleich zu Beginn mit zugegeben – wären sonst kaum unterzukneten gewesen. Müsste auch mit mit grob gemörsertem Pfeffer oder Röstzwiebeln gut schmecken. Fein als Knabebergebäck zu Wein oder Bier. Wer’s nicht ganz so trocken mag, reicht einen Frischkäse- oder Quark-Dipp dazu. Aparna from My Diverse Kitchen is the host of the 12th edition of bread baking day: she has chosen small breads as theme. 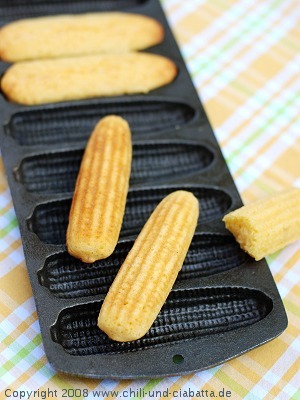 Some days ago I stumbled upon my heavy cornstick pan which I haven’t used for years. I bought it in a mexican food store. This event is a good occasion to reactivate it! You don’t need much time to make these little breads looking like corn on the cob. They are delicious hot from the oven with butter and honey but also plain with soups and stews. Hinweis: Das deutsche Rezept für die knusprigen Maiskolben findet sich unten. Preheat the oven to 450°F (230°C). Heavily grease cornstick pans and place them in the oven to heat. Meanwhile, in a medium bowl, stir together the cornmeal, flour, baking powder, sugar, salt and baking soda. Make a well in the center, set aside. In a small bowl, mix together the eggs, buttermilk and oil. Add the egg mixture to the dry ingredients all at once. Stir by hand just until smooth. Transfer the mixture to a large sturdy plastic bag. Cut off one corner. Carefully squeeze the mixture into the hot cornstick pans. Bake for 10-12 minutes or until the cornsticks are golden. For corn bread, you can bake this batter in a 9-inch square pan, bake in a 450° oven for 25 minutes. Frances Jolley Syfan said that she makes her Crispy Cornsticks the old southern way: preheating the cornstick pan gives you more of a crispy crust, with a tender inside. Maiskolben-Formen* gut fetten und zum Aufheizen in den Ofen stellen. Währenddessen in einer Schüssel das Maismehl, Mehl, Backpulver, Zucker, Salz und Natron mischen. In die Mitte eine Mulde machen, beiseite stellen. In einer kleinen Schüssel Eier, Buttermilch und Öl mischen. Diese Eiermischung zu den trockenen Zutaten gießen und dann von Hand rühren, bis der Teig weich ist. Die Mischung in eine große stabile Plastiktüte (Gefrierbeutel) gießen. Eine kleine Ecke abschneiden und den Teig vorsichtig in die heißen Maiskolbenformen drücken. Bei 230°C 10-15 Minuten backen, die Maiskolben sollen goldbraun sein. 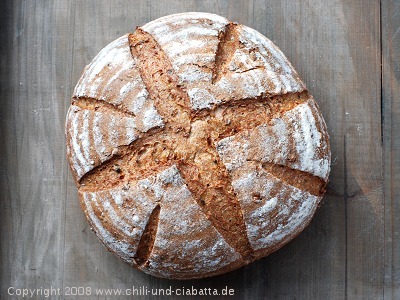 Tip: Wenn man Maisbrot backen will, kann man dieses Rezept auch in einer rechteckigen Form (23×23 cm) bei 230°C 25 Minuten backen. Frances Jolly Syfan: Wenn man im Süden aufgewachsen ist, sind Muffins, Biskuits, Maisbrot und Maiskolben (Gebäck) ein Teil der täglichen Mahlzeiten. Wenn man vorgeheizte Backformen verwendet, bekommen die Maiskolben eine knusprigere Kruste, wobei sie innen weich bleiben. Die Maiskolben schmecken gut warm aus dem Ofen mit Butter und Honig, aber auch solo zu Suppen und Eintöpfen. *Diese maisförmigen Biskuits werden in gusseisernen Form gebacken. Die Zahl der Vertiefungen variiert, ich habe eine Form mit 9 Vertiefungen, auf dem Foto im Buch ist eine mit 7 zu sehen. Ich habe die Form vor Jahren bei Mex-Al gekauft, scheint aber momentan nicht im Angebot zu sein. One year bread baking day! My congratulations go to zorra, the founder of bbd, who hosts this month’s edition Breads with Sprouts. I already baked with sprouted wheat: Sweet Heart of Sprouted Wheat Bread adapted from Rose Levy Beranbaum uses only a small amount of sprouts, the bread turned out very nice. Another attempt after a recipe from Linda Collister using much more sprouts ended in a bread with a very moist crumb (grainpower gained similar experiences with his bbd #11 bread). This time I tried do stay in the middle. I baked the bread for quite a long time and let it rest for 12 hours before cutting it. The crust is relatively thick and the bread a little bit crumbly. The taste is ok, but it will not enter the list of my favourites. Begin about 3 days in advance: Rinse the whole wheat berries, put in a large bowl, and cover with cold water to about 2 inches above the surface of the berries. Soak for 12 hours. Drain well, put into a large glass jar and cover with cheesecloth. Leave in a shaded place. Rinse the wheat berries in the morning and in the evening by adding enough water to cover them through the top of the jar, swirling them around in the jar, then inverting the jar to drain them, until the berries sprout and the sprouts are the same length as the wheat berries, about 2-3 days. If the sprouts are ready before you are ready to make the bread, refrigerate them. Rinse and drain thoroughly, then transfer to a food processor or mixer and chop to the consistency of coarse oatmeal. Mix the flours in the bowl of a stand-type mixer. Stir in the chopped berries. Crumble the yeast into a small bowl, add half the water, and stir until dispersed. Pour into the mixing bowl, then add the remaining water. Mix to make a dough, adding more water as necessary. Mix for about 5 minutes on low speed, then add the salt, mix for 4-5 minuten on medium speed. The dough should clear the bowl, it should be elastic and firm. Place the dough into a lightly oiled bowl, cover with plastic wrap, and leave at room temperature until doubled in size, about 1 hour. Turn out the risen dough onto a lightly floured work surface and let rest covered for about 5-10 minutes. Shape into a round loaf and place it seam side up into a floured banneton. Let rise covered for about 40-50 minutes. Preheat the oven with a baking stone to 425°F. Transfer the risen loaf seam side down onto a peel, score as desired, and load the bread into the oven, spritzing in water twice in the first 5 minutes. Reduce the temperature to 400°F and bake for about 45 minutes or until the bread turns a good golden brown and sounds hollow when tapped underneath. Turn off the oven and leave the bread there for another 15 minute with the door slightly open. Cool on a wire rack. The bread is best left for 12 hours before eating.